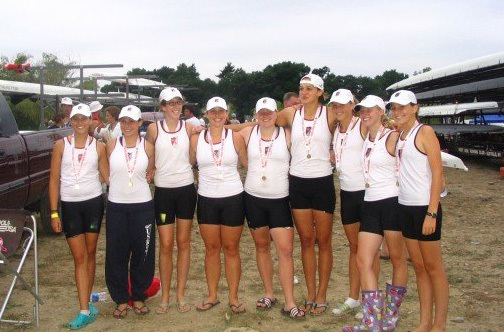 Katie Courtin ’09 coxed the Women’s Junior B Eight for West Side Rowing Club of Buffalo, New York to a first-place gold medal finish! Congratulations Katie! Allison Courtin ’08 raced in the semifinals for the Women’s Junior Eight also for West Side Rowing Club, finishing third and securing a place in the finals on Saturday at 2:30 PM in lane 6. Chris Courtin ’06 raced in the semifinals for the Men’s Senior B Pair for West Side Rowing Club, getting second place and continuing onto the finals on Saturday at 2:20 PM in lane 2. Tim Moore ’08 raced in the heat for the Men’s Junior Pair for Boston Rowing Club, getting second place and qualifying for the semifinals on Saturday at 11:40 AM in lane 2. He also races in the final for the Men’s Junior Eight at 1:20 PM in lane 5. Luke Thoms ’08 will race in the finals for the Men’s Senior B Quadruple Sculls for Quad City Rowing Association of Moline, Illinois on Saturday at 1:00 PM in lane 1. Vaughan Coder ’08 and Andrew Safir ’08 raced in the semifinals for the Men’s Junior Double sculls, finishing fourth but falling short of the second place finish they needed to continue onto the finals. To see results as soon as they are published, check the live feed.